Days on market continue to reflect strong demand, with median days on market in 2018 at roughly a month! How are things going this fall? August and September were pretty typical, following the same pattern as recent years. 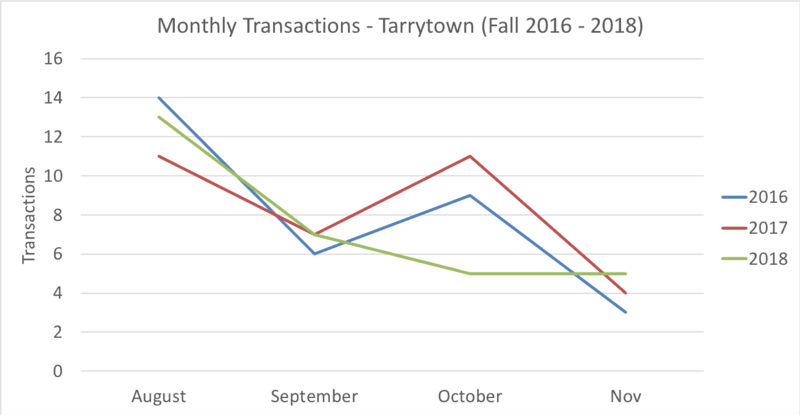 But as you can see in the graph nearby, October was significantly slower than previous years at roughly half the number of transactions recorded in 2016 or 2017. November ended up being a busier month than previous years, and making up for some of the slowness in October, but the cumulative transactions for September, October and November were down roughly 18%, driven by the big drop in October. Note: All data comes from the Austin Board of Realtors’ MLS report, reflecting activity through November 30, 2018.